Yowzers! I like the look of that phone - Engadget has the details, though there's not much to share at this point beyond there being some work already happening between the two companies. I think that's a great sign - it means this isn't a partnership starting from scratch today; it's been evolving for some time now. I say bring it on: the competition to innovate on Windows Phone 7 just took a step up! That is a disaster! Does Nokisoft plans to use HTC as their OEM, or will it be Samsung? Design is very not Nokia-ish! I lost my interest already. Last edited by virain; 02-12-2011 at 06:18 PM.. I dunno, it looks nice to me. 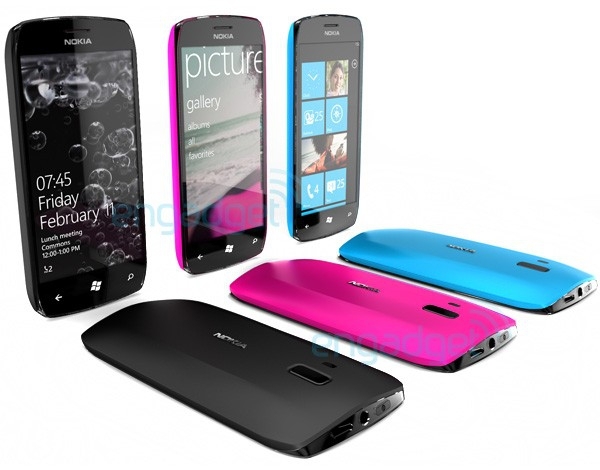 Yes, this would be nice for a current WP 7 OEM phone. But to succed with this OS Nokia needs not just to make "nice" hardware, that is "as good as any other", it needs to impress customers, make something that would put it apart from others, specially with this prefer deal it gets from MS. And it goes not only for specs, because they are pretty much standard for WP 7, but by visual design as well. People buy stuff with their eyes. We'll see what other people say in the comments here, but I really like the visual design of this phone - remember there's only so much an OEM can do with a basic slab design - but I think the colours are bold and unique, the way the back curves upward is slick, and the overall visual design is engaging. If it has a beautiful screen and 16 GB or 32 GB of storage, I'd snap this up today. So I guess what I'm saying is your opinion is your opinion, but don't make it sound like this is some awful design that no one will possibly like. Really, Where is it I said it is awful design, please, read carefully, I said that this design as good as any other, so if you put this phone in line with HTC, Samsung, LG or any other OEM without a name on it, it will not stand out. And from the marketing point of view it's a slow death, taking in an account how things a going for MS and Nokia in a mobile market compare to competition, aka Apple and Android. And as I remember Nokia already experimented with funky colors in the 90s, remember all those colorful changing face plates? That was before smartphones. If it's got the N8's camera then it'll blow away every other WP7 phone. A point to note, though, is that the Start screen displays a little over four rows of Live Tiles, whereas on actual 480 x 800 WP7 devices, they display just under four rows of Live Tiles. Fake mock-ups? Inaccurate mock-ups? Some undocumented resolution? The actual reason is anyone's guess. Fake mock-ups? Inaccurate mock-ups? Some undocumented resolution? The actual reason is anyone's guess. Well, this rules out fake. A new supported resolution is a very strong possibility. Isn't that the truth! I don't know why other Windows Phone OEMs can't do better cameras...? ?